You can donate directly to our webhosting bill at Dreamhost ($10 minimum). Or make a donation of any amount via PayPal. Limited editions of anthologies, cover artwork prints, subscriptions, and PDFs of past issues are all available through our store. Receive one full year of issues delivered to your email in PDF format immediately upon publication. Purchase a one-year subscription in our store. Share fiction with other readers online via Twitter, Facebook, Pinterest, StumbleUpon, Google, email, or dozens of other social media tools using the share buttons floating on the right side of each page. Or just tell your friends the old fashioned way, in conversation. 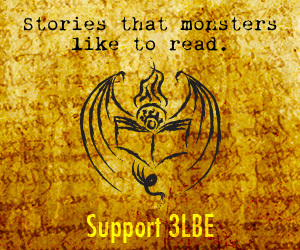 Rate and review 3LBE anthologies on Goodreads, like our Facebook page, mention us on Twitter, write a review on your blog, forum, or publication.